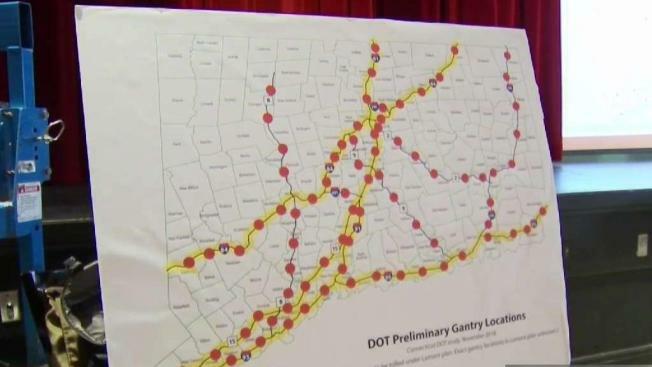 There are several bills in the legislature proposing tolls on Interstates 84, 91, 95 and Route 15. On Monday Republican lawmakers took the fight against tolls on the road and tried to rally people to help stop the controversial plan. Right now several toll bills are moving forward in the legislature. “It’s going to hurt all of us. The little economies. The little businesses,” Lisa Graca said. Graca owns a salon in Watertown and she worries some customers won’t want to pay a fee to drive to her shop. “When you have a client for 20 or 30 years, all of a sudden you’re going to lose that. You’re going to lose that revenue,” Graca said. Graca was among the crowd who heard from state Republican lawmakers during an informational forum at Bristol Central High School on Monday. With three toll bills moving ahead at the Capitol, State Sen. Henri Martin (R-Bristol) and others realized they needed help to put the brakes on the plans. “We said, you know, let’s take it out to the people. This needs to be a grassroots effort in order to persuade and change the minds of those that may be on the fence,” Martin said. Legislators explained why they thought the tolls were a bad idea and encouraged a mostly sympathetic crowd to make their voices heard; including by contacting political leaders who are pro-tolls. There appeared to be a few dozen in the crowd who support tolls and wouldn’t mind the added cost. “Yes, I have no trouble with that,” Paul Morgan of Bristol said. Those in favor of tolls say they could help pave the way for improved infrastructure and better quality of life. For union members it’s also about jobs. “There has to be something done. We have to have a plan for the future. We have a lot of long-term, big projects that have to be built and without a long-term plan or revenue stream, we’re not going to do it,” Nate Brown of the International Union of Operating Engineers, said. There are three more of these forums planned for April in Danbury, Old Lyme and Enfield.